After raising $16 million in funding since launching in 2011, solar-data startup Geostellar successfully raised another $1 million. But, this time it was from the crowd. The Geostellar executive team — founder and CEO David Levine, Chief Technology Officer Breighton Dawe and Chief Financial Officer Mike Rhodes — turned to Return on Change, a crowdfunding platform for social enterprises, to raise $1 million after its biggest investor opted out from putting more money in the enterprise. The investor did, however, allow Levine to reset all of the preferred stock to common stock, which allowed Geostellar to raise money at a lower valuation without negatively affecting the company or current investors, according to Levine as reported by Forbes. Return on Change’s crowdfunding platform is limited to accredited investors who get equity in startups rather than access to new products being developed, such as on other popular crowdfunding sites like Kickstarter. Turns out that it only took one investor to jumpstart the campaign. Shortly after launching in late March, one investor offered to make an investment through a self-directed IRA. With that, as Levine tells Forbes, the crowd followed suit enabling Geostellar to easily reach its goal. Hence, the company’s announcement in early April of a partnership with Pensco Trust Company to facilitate investments using tax-deferred retirement accounts. 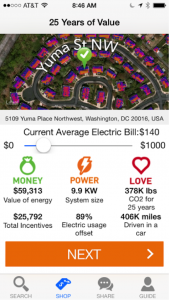 Using data Geostellar simplifies procurement, financing, installation, and maintenance for solar developers and financiers — lowering soft costs, which account from around 60 percent of the total cost of installing solar for residential customers, for both sell side and buy side. Its system, called Solar Mojo, pulls in satellite data to create visualizations of rooftops, thereby presenting a snapshot of their solar potential. Installers can also pull in available incentives and utility rates to bring another level of transparency to the solar process. 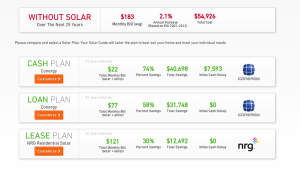 On the consumer side, Solar Mojo presents potential customers with estimates of systems from installers in their area. They can then sign up for the installation through the system, which Geostellar takes a portion of total price once installed. Last October, the company received $750,000 from the U.S. DOE SunShot program, which in part aims to fund companies that lower solar soft costs. In June 2012, it raised $14 million in a Series B from corporate investors NRG and GeoEye, along with the state of state of Maryland and angel investors Flash Forward Ventures. Flash Forward also invested the sole $2 million for Geostellar’s Series A round. The $1 million will be used to develop, release and promote the next generation of the Solar Mojo app for iOS, scheduled for launch May 22 to correspond with the SunShot Grand Challenge Summit 2014. Amidst the crowdfunding campaign, Geostellar also announced four new additions to its Board of Directors. In addition to Levine, the directors now include Paul Feldman, director of Midwest ISO; Tracy McKibben, president and CEO of MAC Energy Advisers; Scott Rotruck, an energy attorney at Spilman Thomas & Battle Law; and Howard Teich, leadership coach and facilitator serving emerging companies. Other “FinTech” startups using information technology and data to bring capital into cleantech include solar-focused startups Mercatus, Clean Power Finance and kWh Analytics; energy efficiency-focused Noesis Energy; and utility energy comparison platform Choose Energy. kwH Analytics also received a DOE SunShot grant. CleantechIQ previously wrote about these startups in a report around IT innovation advanced cleantech business models.